When a new player joins Dan Gooley’s baseball squad, they may be surprised by some of the drills they will run in the fall. Walk by one of their practices, and one may see Gooley, or Skip, as his players call him, drop back into the pocket and swing a football to the outfielder on a slant route. The unorthodox method is not for the nonexistent Quinnipiac football team, though. Instead, it is meant for combat. A fight against an inanimate object. “Rizzo’s Ridge” is the name of the hill that runs from center field to right at the Bobcats’ baseball field. It is a menacing figure for many, but for Quinnipiac, it is a prized advantage against opponents that are not otherwise subjected to such an obstacle. 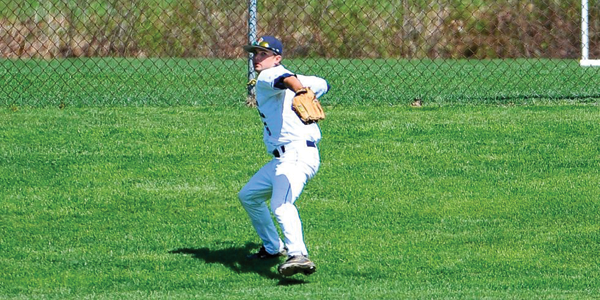 Former Quinnipiac right fielder Ryan Ullrich plays a ball in the outfield on the hill, “Rizzo’s Ridge.” Head coach Dan Gooley named the hill in 2004 after former player Ryan Rizzo because of his ability to play the right field so well. The hill was part of the landscape when the field was erected in the summer of 1967, and few changes have been made over the years. Ranging from 325 feet down the right field line to 400 in center, it is an architectural spectacle scarcely found elsewhere. The hill remained nameless up until 2004, when Gooley coined it after one of the finest fielders he has coached: Ryan Rizzo. Similar to Minute Maid Park, home of the Houston Astros, the ridge offers a steep challenge for any outfielder who tries to run it. Much like its professional counterpart, it can cause chaos and ultimately make the difference in a game. So how does one “beat” the hill? While it may be cliché to suggest that practice makes perfect, that is simply the case here. Gooley and his coaching staff will typically begin that preparation in the fall when the players arrive. After performing the football drills, they will move to making the outfielders catch the balls with a glove off of a toss, which is eventually followed by short and long “fungo” drills to simulate a game situation. Throughout the season, the team will work two to three times a week doing drills with the hill. In 2007, assistant coach Tim Binkowski set the Quinnipiac single-season record for hits with 81. Binkowski used to roam the depths of Quinnipiac Baseball Field and often works with the outfielders at taming the beast that is the ridge. This ideology, Binkowski said, creates a new dynamic between the outfielder and the other players. “Whether it’s the right fielder and the first baseman or whoever, they need to constantly be communicating with each other. [Rizzo’s Ridge] causes knees to give up, and causes short and abrupt steps,” he said. 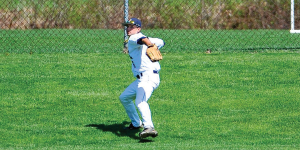 Not only does the hill create issues for the right fielder, but the center fielder as well. Brian Ruditys, a freshman, sees a fair amount of playing time in center. While he said he has not yet been fully challenged by the ridge, he is aware of its presence. Luckily for the freshman, the hill hasn’t caused him any embarrassment yet. “I haven’t tripped yet, but I have seen many people fall flat on their face,” Ruditys said. Over the years, Rizzo’s Ridge has ravaged opponents, no matter how much they scout it. It has also helped provide an identity for the field. For that, Gooley has expressed appreciation. “It’s part of the architecture, it’s part of the culture here. I love it,” he said. Nonetheless, the hill still serves as a test to any outfielder who dares to try to conquer it. It also has an accomplice.